Over the past month, the newly-knighted Knights of the Order have wrought havoc upon the botters and bot-aspirants of highsec, who were taken completely unprepared. Salzenstein and many others like him were forcibly woken from their slumber. That kind of thing can make a man grouchy. 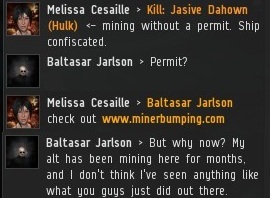 Miners claimed they had no idea that there was a set of rules they had to follow in order to mine in my highsec. Now they're on notice. Salzenstein hasn't been reading enough MinerBumping lately. It's so important to keep up. He was expecting bumps, but he got killed instead. The Agents of the New Order are duly authorized to use anything in their toolkit to help fix highsec. But there are some people who don't approve of the New Order and the change we bring. They want the status quo and more botterdom. And they decided it was time to strike back. Even though it's far cheaper to pay the 10 million isk per year and go for maximum yield, some obstinate miners decided to try tanking our attacks instead. They debated vigorously over whether it was better to go for an active tank or a buffer tank. It's inconclusive. Some miners buffer tank, while others put Civilian Shield Boosters on their 200 million isk Mackinaws. Still others prefer to use no tank at all. 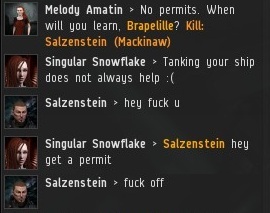 In educated circles, it is known that the permit tank is the best tank. Baani, who has since suffered at the hands of the New Order, recommended the use of remote rep drones. As far as I know, no one has tried that one yet, but I'm looking forward to it. Rokmal Serala, who claims to be "Red Penned and proud", followed us from Tolle. 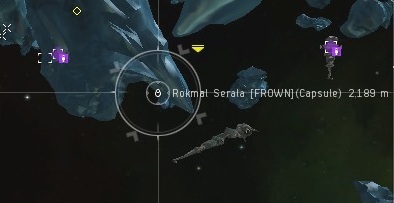 He offered remote reps to all the miners of Brapelille, to save them from our ganks. It didn't go as planned, and he was unable to rescue a single miner. Only the New Order rescues miners. I told him to stop, but Rokmal insisted on giving aid to the resistance. Krom Thomson was another miner who rested all his hopes on the shoulders of his drones. A fleet of Catalysts, however, is more powerful than a handful of drones. Especially when that fleet is filled with pilots who fight for something they believe in. Drones, on the other hand, believe in nothing. They are bots. 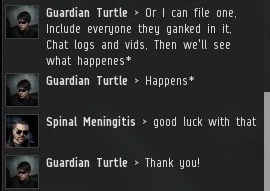 Guardian Turtle's space lawyer spidey-sense told him that ganking is probably a EULA violation. In fact he was confident enough to matter-of-factly inform everyone in local of his interpretation of the rules. A lot of people think that the space lawyers only objected to bumping because it was a creative, unorthodox way to exercise our power. Not so! They objected to it because it was inconvenient. Anything, including shooting at spaceships, can be against the EULA in their minds. The rebel miners found that tanking, using drones, and remote-repping were unable to stop the New Order and its steady march of progress. 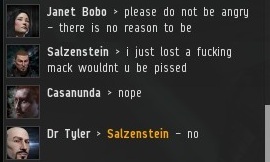 Would petitioning CCP be the answer? 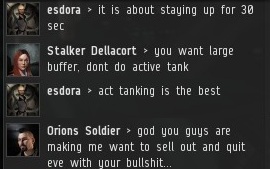 Could the rebels find some way to put an end to the Great Awakening of Highsec? Rokmal Serala sacrificed his Exequror, and his life, in an effort to help the wayward miners of Brapelille. My impression has been that he has a very good attitude about it all, even offering us 'gf' afterwards. Perhaps he should consider joining the New Order. The passive miners of Brapelille give him no thanks for his work. My fighting spirit is still out there just in another clone/jump clone. But it will take some time till i'm back (learning for a shield logi). But i learned 1 thing at this morning. 1. Don't play at 6 am at the morning when you haven't sleep before. Next time i hope it will take more time till you destroy me. I like this rebel. He's more cultured & intelligent than the others. "Krom Thomson was another miner who rested all his hopes on the shoulders of his drones." Those who aspire to become machines place all their hope in the mindless machines that were created to be subservient to us. I can't wait for the first miner to try this while a neutral scout is sitting 800m off their bow. I will literally giggle like a school girl. are there any bounty hunters flying cruisers warp jamming knights at stations? then could someone fit an ecm burst and a mwd to a velator, and basically just counter-suicide ecm whenever a fleet of catalysts opens fire on the miners? You could just counter-suicide with a cheap ECM-bursting ship - not a very good idea, though. You have to be near the gankers, and you don't always know exactly who their target is. ECM and tracking disruption cruisers would be a better strategy. With the Retribution update, there really is no excuse for not having remote repair support. yes.. you can't use ecm burst with safety on. i propose an addendum to the code: a miner may waive the 10 million indulgence fee if the miner creates a suicide gank alt in the service of james 315. No, that is different matter. 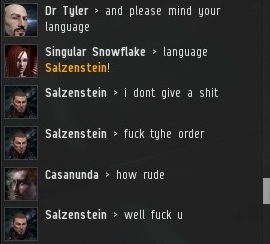 The code dictates all of the miners in Hisec, no exception. However, you will eventually reimbursed if you join more than 10 operations for the Knights. Also, the grace period lasts 365 days since 10 mil payment but a knight lose Catalysts daily basis. ECM burst can only be fit to a battleship right? Or am I mistaken? "you can fit em to anything but it will also jam yourself"
Do you guys really play the game? "Emits random electronic bursts which have a chance of momentarily disrupting target locks on ships within range. Given the unstable nature of the bursts and the amount of internal shielding needed to ensure they do not affect their own point of origin, only battleship-class vessels can use this module to its fullest extent. Note: Only one module of this type can be activated at the same time"
I suggest testing your ECM burst at the Jita undock for maximum effect. Thanks for this polite and Helpful placement. There is something reasonably nice about the "The Rebels Strike Back". I like the suggestion. I want to share some information about it.